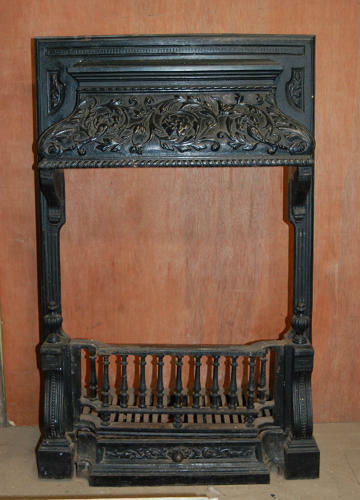 A fantastic, decorative, Victorian cast iron fire insert with a wonderful canopy shaped smoke hood. The hood has fine detailing, with an Acanthus leaf design and roped border. The fire has iron corbels and Adam style finials and the insert has pretty borders along the legs. The firebars and firestool are present and intact and there is an ashpan cover with similar decoration to the canopy. The fire has an RD number that is slightly worn but can be read. The number, RD172207, dates the insert to 1891. The item is in good, solid and useable condition and has a lovely colour. There are some signs of use and wear, and this adds character. The fire does have some small patches of surface rust to the front and the back has surface rust, as expected of antique items. The ashpan cover doe have a small amount of damage to one side, see pictures for details. A very beautiful and unusual item that would give a hearth great character and style.